In 1905 it became clear that the first building erected in 1881 as the Boys' School could no longer accommodate the number of boys. At that stage the boys were accommodated in several buildings in the central part of the town, the Drill Hall, the Girls' School Adderley Street and a room in Botes Butchery. In 1905 Mr Marais was appointed the new Headmaster. The Municipal School Board asked Mr Charles Bullock to design the school building. 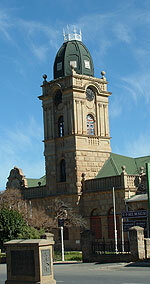 The tender of the Roger Brothers was accepted and the building was inaugurated on the 9th April, 1907. The following is a description of the building by the editor of the Oudtshoorn Courant, Mr Pocock, on 11/4/1907. "It has been built in the beautiful local stone, which will bear favourable comparison with any in the country. The building has been treated in the classic style of architecture and forms a very imposing structure of bold design. The extremely handsome clock tower is carried up to a height of some 90 feet embellished with graceful Corinthian pilasters and roofed with an octagon-shaped panelled roof, which gives a very striking effect. On either side of the tower and standing back some eighteen feet from the front of the same portion of the building are carried out in the same bold design as the base of the tower, but finished at the top with handsome balustrading and each containing two imposing circular headed windows. On either side of the front of the building immediately abutting the portions next to the tower are verandahs with stone columns based on the Tuscan Order, finished at the top with bold arches and cornice supporting roofs covered with patent uralite tiles, which are a distinct relief from the eternal corrugated iron we are accustomed to. The portions above, but behind these verandahs, are finished with bold balustrading on either side of the targets with the names of the schools etc. which in turn are embellished round with Ionic columns, shell effect and pedimental tops, all in bold and handsome design." In 1963, the Girls' and Boys' High Schools were amalgamated as the present Oudtshoorn High School. Ready for demolition, the old building was saved after a petition by several "Old Boys' Highers" The C.P. Nel Museum was moved from High Street to the Boys' High School and opened to the public in 1973. In 1980 the building was declared a National Monument. The School Hall (Gymnasium) was designed by J.C. Vixseboxse in 1912.